LG Electronics, the global leader in home appliances, smart home solutions, and air quality systems has something in store for consumers looking to maximize their electricity savings, make smart energy choices and get rewarded in the process. 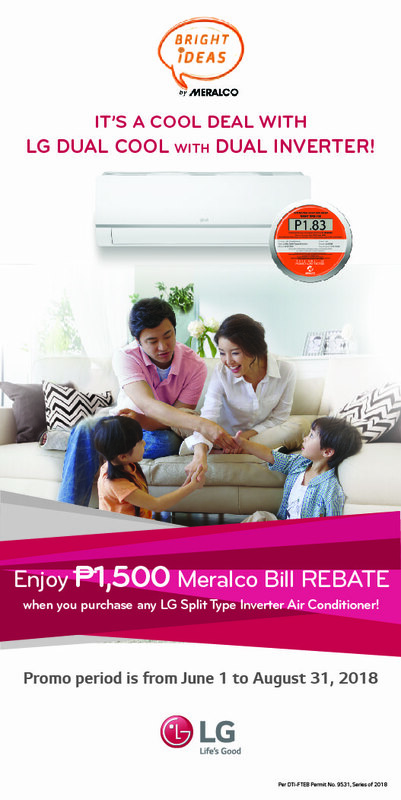 In partnership with Meralco, LG is offering a P1,500 rebate on the electricity bills of those who purchase an LG Split Type Inverter air conditioner at participating dealers in Metro Manila and certain parts of Luzon from now until August 31, 2018. LG’s Inverter system uses a smart Dual Cool technology to moderate the temperature in a room and enable quick cooling when needed, effectively delivering up to 40 percent energy savings. In addition, LG’s stylishly designed split type inverter air conditioners feature an innovative airflow design that assures a quiet, comfortable and pleasant indoor air conditioning experience. The promo is available for cash and credit card purchases, and is exclusive to Meralco customers. While transferrable, rebate cannot be converted into cash. Customers must register at www.LG.com/PH to avail of the promo. Customers can call the LG Customer Information Center at (02) 9025544 for details.